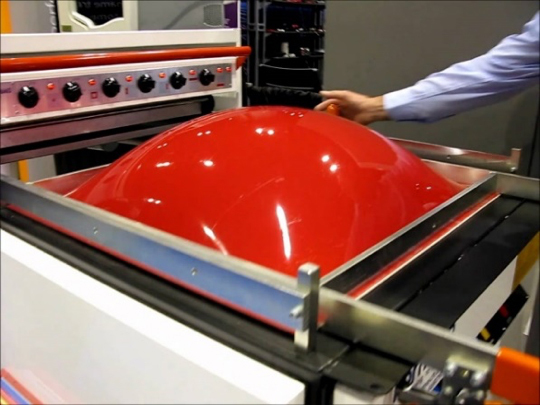 Thermoforming is one of the oldest and most common methods of processing plastic materials. Vacuum formed products are all around us and play a major part in our daily lives. The process involves heating a plastic sheet until it is soft and then draping it over a mould. A vacuum is then applied, pulling the sheet into the mould. After cooling down the sheet is ejected from the mould. In its advanced form, the vacuum forming process utilizes sophisticated pneumatic, hydraulic and heat controls, thus enabling higher production speeds and more detailed vacuum formed applications. The heaters used in vacuum forming are generally infrared elements mounted within a reflector plate. 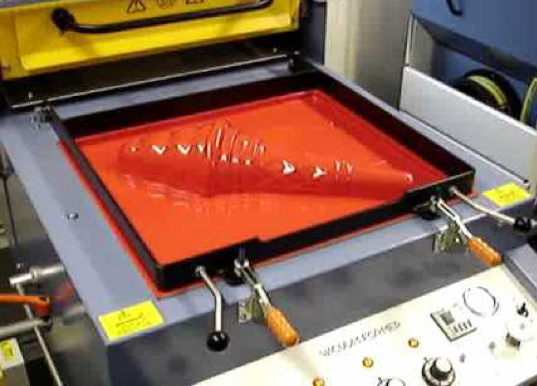 In order to obtain the best vacuum forming results, it is essential that the plastic sheet is heated uniformly over its entire surface area and throughout its thickness. In order to achieve this, it is necessary to have a series of heating zones that are controlled by energy regulators. The plastics used vary from Acrylonitrile Butadiene Styrene (ABS), Polyvinyl Chloride (PVC), Polypropylene (PP) to Acrylic (PMMA) and many more. Each of these plastics has its own specifications and each requires different optimum temperature ranges wherein the forming should take place. Typical products created by vacuum forming are lunch box containers and yogurt containers. In order to process the heated plastic at the optimum forming/stretch temperature it is important to measure the actual temperature of the plastic. Based on this measurement, a feedback loop that controls the timing of the heater will assure the quality is stable under changing ambient temperature conditions. Temperature variations in the processed plastic sheets are also kept under control using this method. Measuring the temperature of the plastic needs to be done without the use of contact sensors, which would touch the plastics and leave a mark on the target. Also, because they touch the target, contact sensors are likely to become contaminated over time. An infrared non-contact temperature sensor avoids these issues and is also well suited to the application because it measures a zone rather than a specific and small point, providing more extensive target temperature information. High accuracy with a repeatability error of only 0.01°C (0.02°F).